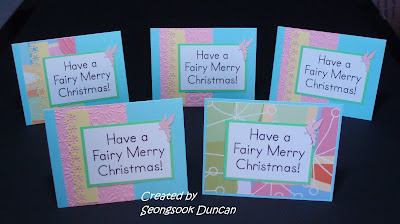 I made these 5 cards for Christmas Cards All Year 'Round challenge -make a Christmas card with at least ONE soft pastel color on it. (could be baby blue, soft pink, pale yellow or pale green). You can do 5 of the same cards or 5 different ones. I used all four colors for my cards. 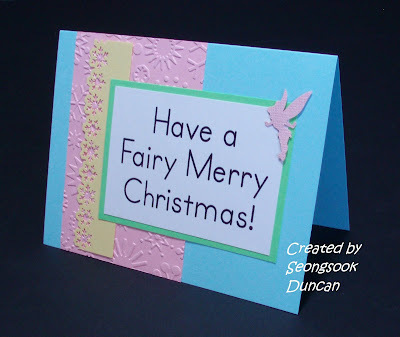 I embossed the pink paper with Cuttlebug EF - snowflakes and punched the border of yellow strip with MS snowflakes border punch. I added Tinkerbell punch-out to match the sentiment. I love this punch although I haven't find many chances to use it. 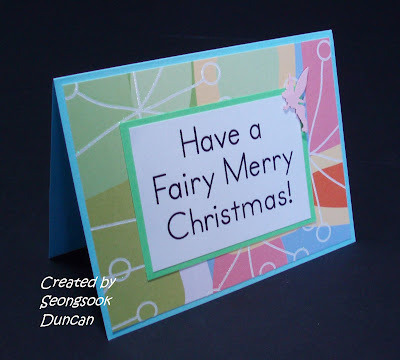 The sentiment is from Pik Cat Studio. These are totally awesome! Such an inspiration!